This post is part of a series on how we built our website. In Part 1 we provided insights why we started a redesign of our site in the first place, and what the process looked like. In Part 2, we focus on the GeneratePress theme and how it plays together with Elementor. This is Part 3, the focus of this post is on Elementor, sharing all the learnings made while building this site. Imagine this: A designer handing you a web design in photoshop, and you can implement the design on your website without writing a single line of code, just by using visual design software. That’s the promise page builders make. The concept of WYSIWYG editing (What You See Is What You Get) is as old the internet, but it seems in the last 2-3 years we have made tremendous steps to finally get there. 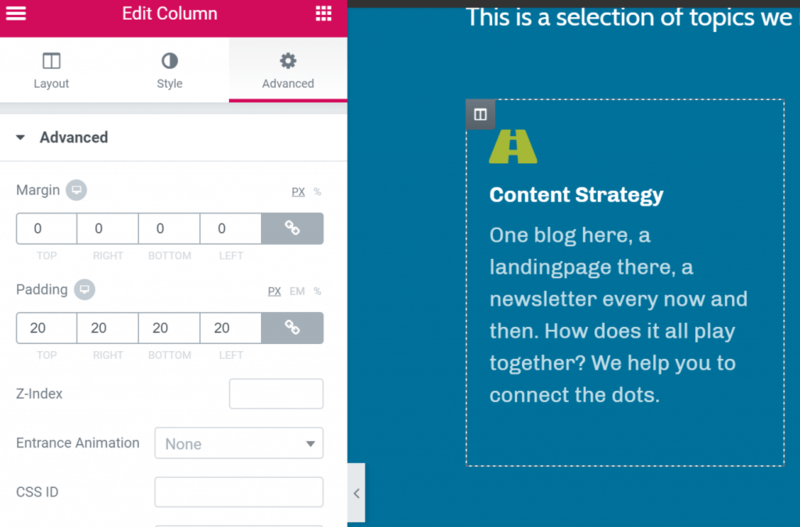 This post is about Elementor, a page builder for WordPress, that allows you to do exactly that. Quickly building landing pages is often a requirement for digital marketers. In the last few years, the tools and apps supporting this task have become better and better. Elementor is a WordPress plugin that adds a page builder functionality to your existing WordPress theme and allows you to do exactly that. If you are used to working with WordPress and have been involved in website projects in the past, you will quickly feel at home in Elementor. Back then Elementor was the new page builder around the block, now it is a very well known player in the WordPress community. In this post I want to go into the specifics on how we used Elementor to build the start page for our agency website. In my last post in this series I wrote about GeneratePress, the theme we use for our site that defines some ground rules on how our site behaves. I have spent many hours in implementing a design created by one of our freelancers, without writing code. 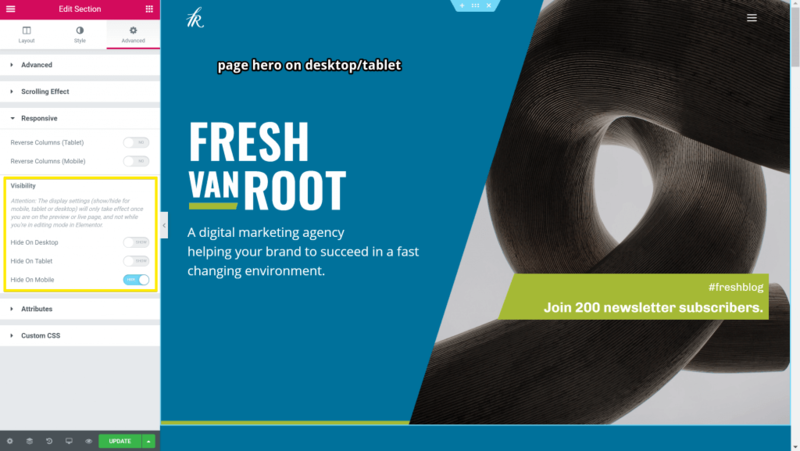 Here are my learnings creating our agency frontpage using Elementor. Keep Responsive Design In Mind From The Beginning! Constantly switch between Desktop and mobile editing early on in your project, or even try to concentrate on mobile first. Why? First, because Elementor is not very good at translating the desktop settings of your site to mobile. (i.e. paddings or margins of your desktop settings). 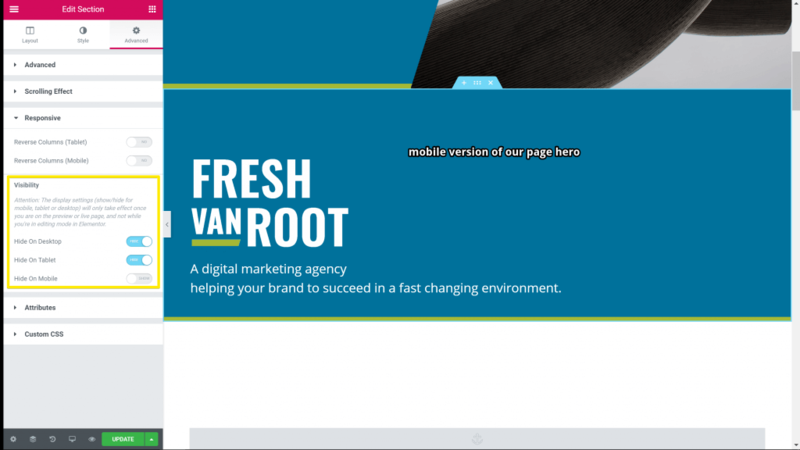 You may be surprised how your page looks like if you switch to mobile view for the first time after finishing the desktop design. You should use these styling elements, they can make your site very unique! Just don’t exaggerate when using them or combine all of them in one section. This directly relates to the previous paragraph about making your site responsive. If you run into the problem of having a really cool design idea for your page, it might happen it only looks cool on the desktop or tablet version of your site. You can create a separate “light” version of the element for mobile, and use the advanced responsive settings on the element depending on your users device. We do that for our page hero on our site. There was no way in displaying the two-column layout in a way that it looks cool on mobile too. There was just no elegant way to get the same element displayed on mobile with the same style details. So we decided to create a simpler version with less complicated design for mobile. The following section is a one-column layout, and uses the “hide on tablet / desktop setting”. This is of course only recommended for elements that are pretty static on your site. For content that needs to be updated frequently stick to one design that works well on both mobile and desktop. Paddings and Margins are used all over a website for spacing between elements. With Elementor, you can edit these settings on all levels on your site, which is really powerful. Whenever possible edit these settings on section or column level. Why? Its easier to customize for responsive behaviour of your site later on. In most cases, margins and paddings on column level will do the trick. This feature is not around in Elementor for very long but vital when building a site. It relates also to the previous paragraph here about paddings and margins. The copy style feature is a great way to be sure to get a consistent design across your page. Working in Elementor is a click and scroll marathon anyway, try to take shortcuts when possible! Every website has content elements that are used on several pages on your site. Global widgets in Elementor are a real time saver and a big advantage when it comes to managing a large number of pages. The benefit of Global widgets is that once defined they can be re-used on any page in Elementor. You can edit the global widget and it changes on all sites the widget is used on or decide to unlink the widget and create an independent version of the element. On our site, examples for such a global widget would be the call to action section at the bottom of our client portfolio pages and the contact form. Basic Form Needs Are Covered! Nearly every website uses forms to collect customer data. Elementor comes with a forms widget that covers all basics, including the option to specify a width for each form element. This feature might make installing a plugin for just that task obsolete. The reason why you have chosen Elementor to build your site with are the cool templates available. If you are interested in a specific style you can import a page or block and take a look (and use the copy design feature to immediately apply the style on your component). I also recommend using templates for your own site. Finalize one page of a category (i.e. the design of a client case study, a product detail page), test it on all screen sizes and then save the page as a template. Final means with real content. I am used to getting great support from WordPress theme developers. Both the team from Enfold and GeneratePress have been excellent at this. They are going the extra mile for making your experience using their themes awesome. With Elementor, there is no official support forum to post questions too. The comparison might not be fair: Elementor is a design tool and you can start out on a blank canvas, you can create your very own theme with Elementor. This opens the door for endless questions. When is a question still a support question, when is it about the design of a site and you should figure it out yoursefl? 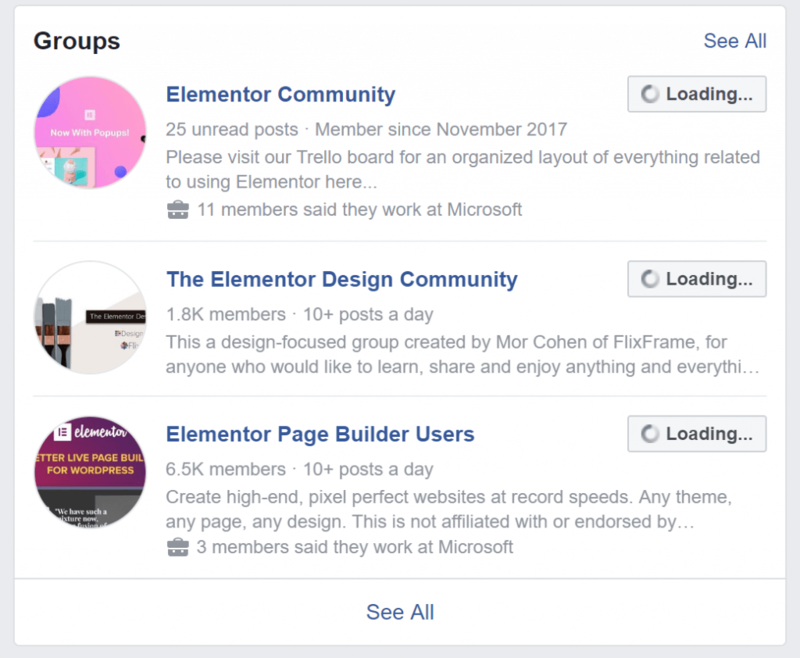 There are many groups about Elementor on Facebook! There are Elementor docs you can read, but most support comes from the community itself. YouTube videos on Elementor, and Facebook Groups. I am not a software developer, but I imagine that developing a web app like Elementor is a complicated project. During many hours of editing I never experienced glitches, or lost work due to crashes of the editor or anything similar. Should You Use Elementor Pro? Are you building a page for a business and have plans to constantly edit, update and add content to the site. In short, is it a site that is crucial to your business? Then go with Elementor Pro! You may start out using the free version of Elementor and switch to the Pro version later. Nothing of your settings or content will get lost! In general, we are happy with our decision to use Elementor to design our website. 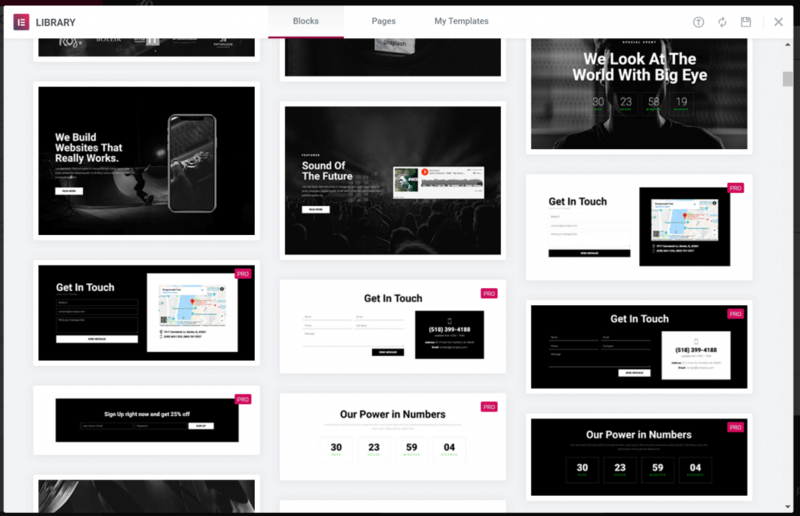 We created lots of landing pages for clients based on the Enfold theme in the past, that might finally change this year as Elementor offers way more possibilities. Keep in mind that Elementor is still a young product and new features are constantly added. A comparison between Enfold and Elementor. Web design – where to look for inspiration.